The DHEA test measures the DHEA blood level. This DHEA blood test helps check for abnormal dehydroepiandrosterone levels. The DHEA test measures the DHEA-S blood level. Why is a DHEAS blood test important? The DHEA blood test helps in the evaluation of low libido and energy and poor sleep. 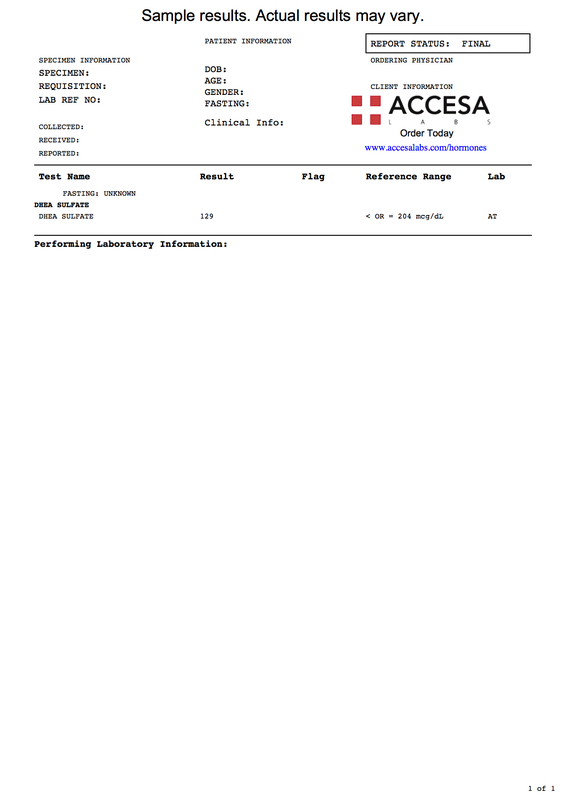 This DHEA Test is a blood test. The DHEA test, also known as a DHEA-S test, DHEA lab test, DHEAS blood test and dehydroepiandrosterone sulfate test, measures the DHEA blood level. DHEA is an androgen steroid hormone produced by the cortex of the adrenal glands. DHEA is made from cholesterol with influence from the hormone ACTH. DHEA sulfate (DHEA-S) is formed from DHEA when a special molecule known as a sulfo group is added to it. While quite similar, DHEA-S and DHEA have a few differences. DHEA-S is not thought to have any major effects on body functions (inert) while DHEA has weak effects in the body. DHEA-S binds to carrier proteins like albumin in the blood much more strongly than DHEA. DHEA-S also lasts longer in the body (i.e. longer half life) when compared to DHEA and, consequently, is easier to measure with blood testing. Generally speaking, both DHEA and DHEA-S levels increase throughout childhood and are at their highest levels in the second and third decades, after which they decrease. While DHEA does not have major effects itself, it is considered a prohormone in that it is used to make various other powerful steroid hormones like estrogens. Despite its importance in this regard, DHEA supplementation is still somewhat controversial when used to replace hormone in people with known DHEA deficiencies. DHEAS declines with age. The DHEA test is often used in looking for specific medical conditions that may result in abnormal levels of DHEA hormone. Abnormal DHEA levels might help identify tumors or dysfunction of the adrenal glands, polycystic ovarian syndrome (PCOS), causes for excessive face and body hair, and fertility issues related to getting pregnant or irregular menstrual cycles as excessively high levels of DHEA sulfate can result in a deeper voice, acne and baldness. DHEA is frequently ordered with the estradiol test and testosterone free & total test. To get a DHEA test near you at a Quest Diagnostics lab, just order online and get your blood drawn at the selected location. Once the DHEA lab report is ready, it will be available for download. As can be seen on the sample DHEA lab results above, the DHEA blood level is reported as a numerical value and can be compared against the reference range provided by the lab. Because of the important role that DHEA plays in PCOS, it is included as a component of the PCOS test panel. DHEA Test at Guaranteed Prices.